Knowing the type of soil, water needs, and eventual size of the tree will help you select the best tree for your yard. Deciduous trees (trees that lose their leaves) will help cool your home in the summer and allow the sun to warm it in the winter. Planting the right tree in the right place can deliver up to 30% in summer energy savings. Site your tree where the tree can grow to its full size. Plant at least 8 feet from sidewalks and driveways, 15 feet from home foundations and swimming pools, and 6 feet from fences. If you plant more than one tree, make sure they are sited far enough apart to allow full growth of both trees. 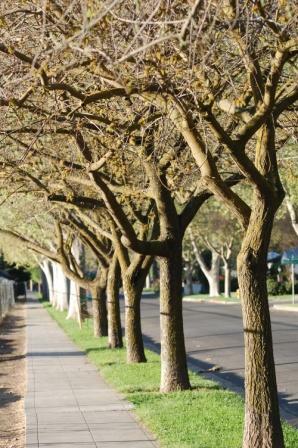 Trees should be placed 12 to 30 feet apart depending on their ultimate size. Before you dig call Underground Service Alert at 800-227-2600 four working days before you start working. Their advice will help make sure that the spot you have chosen doesn’t have any underground lines that could endanger you or anyone else involved in the planting. Remove and discard grass and weeds about 4 feet around your tree. Dig your hole 4 feet wide and 8 to 10 inches deep. Dig an additional 8 inches of soil around the edge to create a solid 12-inch wide pedestal in the center of the hole. Remove the entire root ball from the container. Thoroughly loosen and extend side and bottom roots from the root ball. Cut any roots circling the root ball with a sharp tool. Place the root ball on the pedestal so the root crown (where the trunk meets the roots) is about 1 1/2 to 2 inches above the surrounding ground level. Be careful not plant too deeply. The root crown (where trunk meets the roots) should be 1-1/2 inches to 2 inches above ground level. Place the existing soil back in the hole. Do not place grass or weeds in the hole. When backfilling the hole, avoid air pockets by lightly tamping, but don’t compact the soil. Refill the hole only up to the top of the root ball. Be sure that you have properly staked the tree to allow for some trunk movement, encouraging strong and straight growth. The goal is moist soil as far as 8 to 12 inches below the surface. For the first three years, young trees need weekly watering from mid-April to mid-October. Probe the soil 8 to 12 inches below the surface before watering. If the soil feels moist and sticky, allow it to dry for several more days before watering. If the soil feels dry and crumbly, water deeply once a week. The best way to deep water trees is to use a soaker hose (or a garden hose set to a trickle) that slowly applies water to the soil over several hours. Water deeply by setting your hose on a slow trickle for several hours at the base of the tree or use a soaker hose around the tree. On average, your tree will need about 15 gallons of water per week. Remember that lawn watering will not replace the need to deeply water young trees. Watering during our rainless months varies greatly depending on the tree species, daily temperatures, and location in the yard, as well as soil texture, structure and depth. Watch your investment grow – keep your tree healthy and watch it thrive. Weeds and grass compete with trees for water and nutrients. Weeds can also produce a chemical which inhibits the growth of other plants, including trees. Keep a 4-foot circle around your young tree clear of grass, weeds, or other plants. Spread mulch in a 4-foot diameter around your tree, 4 inches away from the trunk, and 6 inches deep. The mulch will keep soil temperatures cool, retain water, and discourage weeds. Do not use weed trimmers or lawn mowers near the base of trees. Hand-pull weeds instead. When the thin bark of young trees is injured, the bark will split and die back. This can cause disease, unwanted pests, and sun damage to the bark.